Spoon a few golden flax seeds into your smoothie for super nutrition. Tropical fruit, flax seeds, and Greek yogurt combine for one delicious and highly nutritious smoothie. This may seem like an odd combination of ingredients for a smoothie, at least it did for me, which is why I put off making this dude for a while. Big mistake. I was pleasantly surprised by how tasty, and creamy, this smoothie turned out. Kiwis are high in vitamin C (antioxidants), fiber (good digestion), and potassium (cardiovascular health). Mangoes are loaded with an array vitamins and minerals that support good digestion, are high in antioxidants, protect against certain cancers, and offer anti-inflammatory properties. 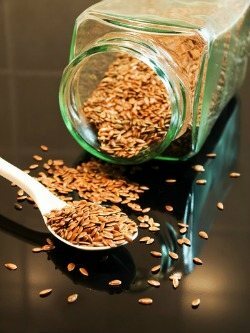 Flax seeds are the star ingredient of this smoothie and a borderline superfood in my book because of the following. They help balance cholesterol levels, are anti-cancerous, anti-inflammatory, are good for heart health, help with diabetes, boost the immune system, and are high in antioxidants, dietary fiber, and the all important omega-3 fats. Greek yogurt is high in protein, calcium, and probiotics (think healthy gut flora), and lends a rich creaminess to your smoothie, perhaps its best attribute. And there you have it, an antioxidant powerhouse, fiber packed, nutrient dense smoothie perfect for breakfast or as a meal replacement. Incorporate a few of my suggested add-ons or other goodies you have around your kitchen to take the nutrition up a notch or two. Enjoy! Let me know what you think of this tasty kiwi mango flax seed smoothie by leaving a comment below. Happy Blending! I made this smoothie yesterday. First time ever making a smoothie & my husband, my mom & I loved it! Even my 16 month old wouldn’t stop drinking from my cup. She’s been sick & hasn’t been wanting to eat anything so we were glad she kept, something as healthy as, this down! I’m looking to lose at least 60 lbs and be back at my pre-pregnancy weight of 125! I’ve been doing yoga & I have a gym membership, which has helped, but I know I wasn’t eating/drinking right, but since I’ve come across your site (just 4 days ago) I’ve been a lot more conscious of what I eat & drink. I’m getting all the veggie/fruit servings that I wasn’t getting before. I hope to get to a healthy weight by May! It sounds like you’re well on your way to reaching your target weight by May. You can do it! Thanks for kind words about my site and content. It means a lot. A substitute for the yogurt, would coconut oil be suitable? About 1 tablespoon.? Yes, Ron, about 1 tablespoon of coconut oil in place of yogurt is good, and ensures you get enough healthy fat.